NASA engineers burst into cheers and applause as they received signals confirming InSight's landing on Martian soil. PASADENA (California) • Cheers and applause erupted at Nasa's Jet Propulsion Laboratory as a waist-high unmanned lander, called InSight, touched down on Mars, capping a nearly seven-year journey from design to launch to landing. The dramatic arrival of the US$993 million (S$1.4 billion) spacecraft - designed to listen for quakes and tremors as a way to unveil the Red Planet's inner mysteries, how it formed billions of years ago and, by extension, how other rocky planets like Earth took shape - marked the eighth successful landing on Mars in Nasa's history. "Touchdown confirmed," a mission control operator at the National Aeronautics and Space Administration said, as pent-up anxiety and excitement surged through the room, and dozens of scientists leapt from their seats to embrace each other. "It was intense and you could feel the emotion," administrator Jim Bridenstine told Nasa Television in an interview afterwards. Mr Bridenstine also said President Donald Trump and Vice-President Mike Pence had watched on television and called to congratulate the US space agency. "Ultimately, the day is coming when we land humans on Mars," Mr Bridenstine said, adding that the goal is to do so by the mid-2030s. The Soviet Union's Mars 3 lander is the first spacecraft to land on Mars - on Dec 2, 1971. It fails shortly after landing. Nasa's Viking 1 is first US spacecraft to land successfully on Mars - on July 20, 1976. Viking 2's lander reaches Mars on Sept 3, 1976. Nasa's Mars Global Surveyor lands on Sept 11, 1997. It goes silent in November 2006. Nasa's Mars Pathfinder lands on July 4, 1997. Its mission includes the first successful rover on Mars, called Sojourner. Nasa's Mars rover, nicknamed Spirit, lands on Jan 3, 2004, three weeks before its twin, Opportunity, lands on the other side of the planet. The Phoenix Mars Lander lands on May 25, 2008. Part of Nasa's Scout programme for smaller and lower-cost spacecraft, it is designed to study water in the Martian arctic, and search for a habitable zone. But, as expected, the dust kicked up during the landing obscured the first picture InSight sent back, which was heavily flecked. France's Centre National d'Etudes Spatiales (CNES) made the lander's Seismic Experiment for Interior Structure instrument, the key element for sensing quakes. The principal investigator on the French seismometer, Professor Philippe Lognonne, said he was "relieved and very happy" at the outcome. "I've just received confirmation that there are no rocks in front of the lander," he said. And in a final crucial phase, Nasa said InSight signalled to Earth that its solar panels - twin solar arrays spanning 2.2m in width - had opened and were collecting sunlight on the surface of Mars. "The InSight team can rest a little easier... now that we know the spacecraft solar arrays are deployed and recharging the batteries," said Mr Tom Hoffman, InSight's project manager. The spacecraft is Nasa's first to touch down on Earth's neighbouring planet since the Curiosity rover arrived in 2012. Nasa is invested in these robotic missions as a way to prepare for the first Mars-bound human explorers in the 2030s. "We never take Mars for granted. Mars is hard," Dr Thomas Zurbuchen, Nasa's associate administrator for the science mission directorate, said on Sunday. 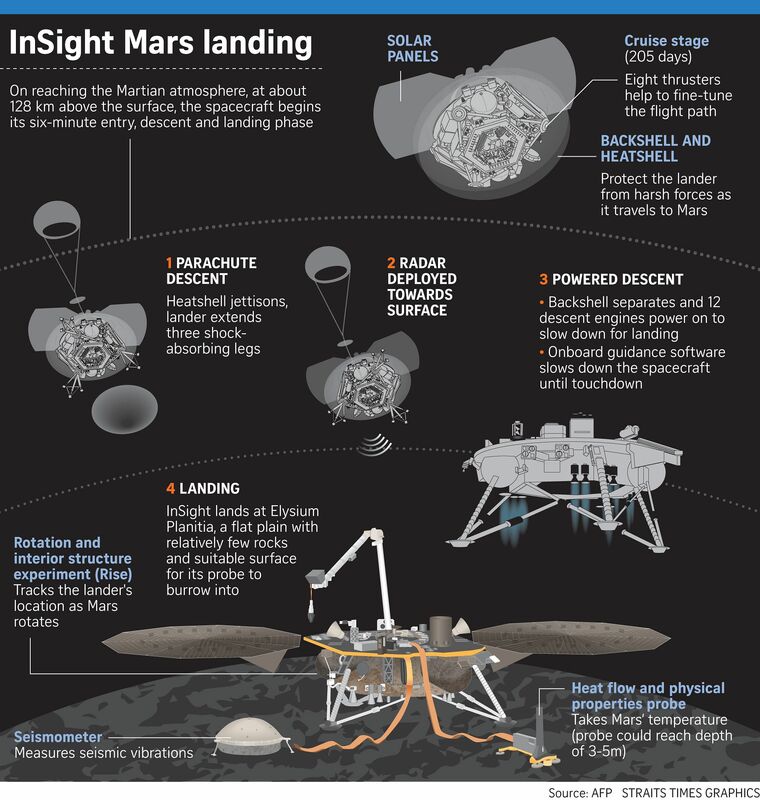 The nail-biting entry, descent and landing phase began at 3.47am Tuesday Singapore time at Nasa's Jet Propulsion Laboratory in Pasadena, California, home to mission control for Mars InSight. A carefully orchestrated sequence - fully pre-programmed on board the spacecraft - unfolded over the following several minutes, coined "six and a half minutes of terror". Speeding faster than a bullet at 19,800kmh, the heat-shielded lander encountered scorching friction as it entered the Mars atmosphere. The heat shield soared to a temperature of about 1,500 deg C before it was discarded, the three landing legs deployed and the parachute popped out, easing InSight down to the Martian surface. Besides France's CNES, the German Aerospace Centre provided a self-hammering mole that can burrow 5m into the surface - farther than any instrument before - to measure heat flow. Spain's Centro de Astrobiologia made the spacecraft's wind sensors, and three of InSight's seismic instruments were designed and built in Britain. Other significant contributions came from the Space Research Centre of the Polish Academy of Sciences and Astronika and the Swiss Institute of Technology. The goal is to map the inside of Mars in three dimensions, "so we understand the inside of Mars as well as we have come to understand the outside of Mars", said Dr Bruce Banerdt, InSight's principal investigator at the Jet Propulsion Laboratory.